Business demands extensive capital, manpower, skill, resources and knowledge. Apart from this you also need good computing power and business app to enhance efficacy of business. 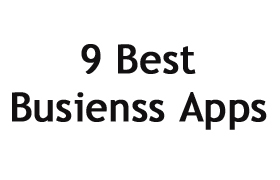 Multiple smartphone apps are available in market today I will provide you information about 9 best apps for business. Microsoft Office Mobile is office application app from Microsoft. This app allows you to open word, excel and PowerPoint documents on the go. This app is automatically optimize documents based on your mobile screen layout. This app also allows you to edit these documents. Beauty of this tool is although you are editing on mobile formatting and content remains intact. You must download and use this app for business. Another best app for business is Lync client. This apps are best collaboration tool. It allows you to stay connected with your team on the move. You can have IM, Voice and Video call using Lync. Lync client require on premise Microsoft Lync server. Cisco Webex app allows you to conduct online meeting or presentation with your client one the move. Webex allows presentation/screen sharing, voice and video conference facility. You can also make multiparty video call using this tool. Cisco Webex is license product and you need to spend few dollars for the same. One Note or Ever Note is very good note taking business tool. This tool allows you to keep all data at single place be it handwritten notes, photos, videos, web articles or anything else. This tool works with multiple devices. It also keep all data in sync. It comes with powerful search and tagging functionality. You should use this app for business. Google My business is tool that connects you with your customer directly. It allows you to update your business information on google search and on map. This tool can act as good marketing tool. You can share news, updates, event information about your business on this tool. Business calendar is free business app that keep track of all your important meetings and appointments. It also allows you to add favorite bar for easy access. You can scroll and view daily and monthly calendar view. Search facility and color coding facility is available with this tool. Google Drive is business app for taking backup of your important data. Google by default provide 15 GB space to end users. This limit can be further enhanced to 30 GB. You can store your all important documents, photos, videos with google drive. Card Scanner is wonderful business app. This app comes with OCR facility. Take Snap a photo of a business card using your mobile camera and this app will read and extract details from this snap. This app also supports multiple languages. CRM app by ZOHO help you to access customer information available on CRM portal of ZOHO. This tool offers complete customer relationship management. You can manage end to end customer details from this tool like sales, marketing, customer support and inventory activity etc. Hope these tools will help you to enhance productivity of your business.